The list of academic options at Oakland University is constantly growing. OU currently offers more than 130 undergraduate degrees and more than 135 graduate and certificate program options. Students have the opportunity to participate in high-level research as early as their freshman year. Check out Oakland University's admissions sites for application guidelines, academic programs and information on how to pay for your education. Sign up to visit OU for a campus tour or admissions event geared toward you. Apply online today at oakland.edu/apply — it's free! From important registration reminders to daily events, stay focused on the finish line while getting the most out of your educational experience. Approximately 275 active student organizations take learning to a new level, while student service offices are here to help you succeed. Over 100,000 alumni proudly call OU their alma mater. Upon graduation, you will automatically be welcomed as a member of Oakland University's very active Alumni Association. Alumni stay connected through networking, volunteering and mentorship programs. Nearly half a million people visit campus each year to explore OU's cultural icons, such as the home to OU's founder, our very own National Historic Landmark. Be inspired by guest speakers from around the world, or awed by artwork, student, faculty and guest performances. 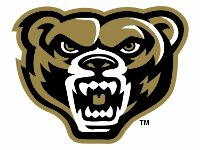 The Golden Grizzlies' growing Division I athletics program is a member of the Horizon League, one of the NCAA's top performing leagues. Oakland captured the McCafferty Trophy in 2014-15, given to the league's all-sports champion. Oakland University offers 18 intercollegiate sports.